Welcome back. Guess what. I’ve started receiving advertisements in the mail for hearing aids. The vendors probably figure he’s old, he must need hearing aids. I wonder who told them I was old. 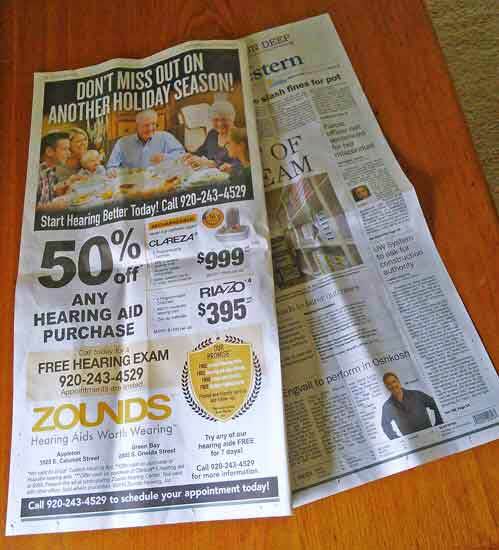 All of the direct mailing about hearing aids used to be addressed to my father-in-law. We share the same address. He, like several of his buddies, already has hearing aids, though he prefers to go unaided. For an interim step, some vendors added my name to his address label. 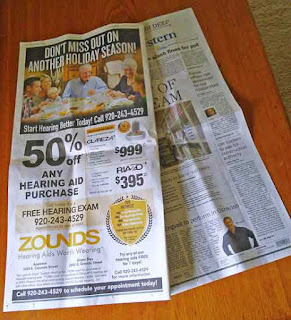 While I’m immensely gratified that the vendors now think enough of me to send me my very own direct mailing for recycling, if I were in the market for hearing aids, I could just check out the ads in the local newspaper. Hearing aids or audiologists are frequently advertised, and the ads are big in case your vision has gone the way of your hearing. I can’t fault the vendors for linking age to hearing loss. According to the National Institute on Deafness and Other Communication Disorders, hearing loss affects about one third of U.S. adults age 65 to 74 and nearly half of those over 75. The usual cause is age-related changes in the inner ear, or less commonly, changes in either the middle ear or the nerve pathways from ear to brain. Certain medical conditions or meds themselves might be involved. It’s difficult to separate age-related hearing loss from that caused by factors such as noise. In fact, hearing loss in most older folks is both age- and noise-related. All that aside, a recent study showed that what seems to be age-related hearing loss may instead be age-related loss in the brain’s ability to process speech, especially in noisy environments. University of Maryland researchers monitored brain responses of older and younger adults while someone was speaking to them in two settings: in a quiet environment and in the presence of a competing talker, speaking either English or an unfamiliar language (Dutch). All test participants--15 older adults, ages 61 to 73, and 17 younger adults, ages 18 to 27--had clinically normal hearing. The older participants had also been screened for dementia and rated no worse than mild cognitive impairment (a score of 22 or higher on Montreal Cognitive Assessment). Brain monitoring was done with two noninvasive, neurophysiological techniques--magnetoencephalography (MEG), which measures the magnetic fields generated by neuronal activity, and electroencephalography (EEG), which records electrical activity. The researchers focused on two areas of the brain--the midbrain (aka mesencephalon), which plays a major role in auditory processing, and the cerebral cortex, whose responsibility includes language and information processing. The researchers found the cortical and midbrain responses of the older adults were more dependent on the level of background noise and more affected by the information content of the background noise than the responses of the younger adults. Normal hearing notwithstanding, the ability to process speech when there was a competing speaker present degraded significantly with aging. The effect was more pronounced when the competing speech was in English and thus understood than when it was in an unfamiliar language and thus incomprehensible. In an earlier blog post (Brain Focusing with Sound), I wrote that I was having a harder time ignoring distractions, which apparently is characteristic of aging. So what should you do when conversing with someone like me, whose hearing is fine? Not much right now, but planning ahead, try to find a quiet space; don’t speak louder, but do speak clearly and maybe a tad slower than you would normally speak; and since actually seeing the speaker helps the listener process the speech, try to get my attention. That will be easier, of course, if you find a topic of interest.